Over the past five years or so, clients have increasingly asked us to help them produce copy for their staff digital newsletters. We can write articles from scratch (e.g., on the basis of interviews), rewrite or edit existing material, or translate from Dutch into English. A monthly e-zine to give Philips staff around the world who are involved with personal care products a sense of community, enabling them to share best practices, market insights and product information. A monthly opt-in digital newsletter for DSM’s Sales & Marketing teams around the world to encourage the exchange of best practices and success stories. It reaches some 1,500 people within DSM. A quarterly PDF newsletter for Philips’ Coffee Business Group. Based in Italy and the Netherlands, the group has sales staff around the world. 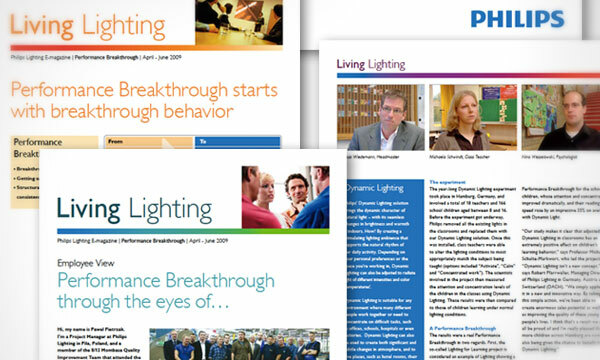 A quarterly digital newsletter for the staff of Philips Lighting, with articles on strategic issues, success stories and best practices. It is distributed to approx. 3,000 people worldwide. A quarterly e-zine for employees of the Belgium-based Portable Air division of Atlas Copco Airpower, with a strong focus on corporate messaging and success stories.